The universe is a huge wide open space that holds everything from the smallest particle to the biggest galaxy. No one knows just how big the universe is. Astronomers try to measure it all the time. They use a special instrument called Spectroscope to tell whether an object is moving away from the earth or towards the earth. Based on the information from instrument, scientists have learned that the universe is still growing outwards in every direction. Scientists believe that about 13.7 billion years ago, a powerful explosion called “The big bang” happened. This powerful explosion set the universe into motion and this motion continuous even today. Scientists are not yet sure if the motion will stop, change direction or keep going forever. Amazing Fact: A space vehicle must move at a speed of 11 km per second to escape the earth’s gravitational pull. Amazing Fact: Scientist believe that hydrogen comprises approximately 90 to 99 percent of all matter in the universe. Most of the astronomers believe that the universe began in a big bang about 14 billion years ago. At that time, the entire universe was inside a bubble that was thousands of times smaller than a pinhead. It was hotter and denser than anything we can imagine. Then it suddenly exploded. The universe we know was born. Time, space and matter all began with the big bang. In fraction of a second the universe grew from smaller than a single atom to bigger than a galaxy. And it kept on growing at a fantastic rate. It is still expanding. After 300000 years, the universe had cooled to about 3000 degrees. Atomic nuclei could finally capture electrons to form atoms. The universe was filled with clouds of hydrogen and helium gas. Amazing Fact: More than 75 million meteors enter the earth’s atmosphere everyday; but they disintegrate before hitting the ground. Amazing Fact: There are more stars in the universe than there are grains of sand on Earth. The chemical composition of the universe and the physical nature of its constituent matter are the topics that have occupied scientists for centuries. Human being, the air we breathe, and the distant stars all are made up of protons, neutrons and electrons. Astronomers like to call all material made up of protons, neutrons and electrons “baryonic matter”. Until about thirty years ago, astronomers thought that the universe was composed almost entirely of this baryonic matter, ordinary atoms. However, in the past few decades, there has been ever more evidence accumulating that suggests that there is something in the universe that we cannot see, perhaps some new form of matter. According to the latest observational evidence, ordinary matter, including stars, planets, dust, and gas, only make up tiny fraction of the universe (5 percent). The rest is the elusive dark matter (25 percent) and dark energy (70 percent). Dark energy: A mysterious (and as yet hypothetical) form of the energy which is spread out uniformly throughout space (and time) and which has anti-gravitational properties. It is one of the possible explanations for the current accelerating rate of the universe. Dark matter: Matter is not visible to us because it emits no radiation that we can observe, but it is detectable gravitationally. Hydrogen and Helium gas: Hydrogen and helium gas are the most abundant element in the universe. These elements are found in great abundance in stars and gas giant planets. Stars: A ball of mostly hydrogen and helium gas that shines extremely brightly. Our sun is a star. Neutrinos: A small particle that has no charge and is thought to have very little mass. Neutrinos are created in energetic collisions between nuclear particles. The universe is filled with them but they rarely collide with anything. Heavy elements: Planet like ours. Amazing Fact: Did you know that if you fell into a black hole, you would stretch like a spaghetti. Amazing Fact: The sun travels around the galaxy once every 200 million years- a journey of 100,000 light years. The age of the universe is defined as the largest possible value of a time like curve from the earth at the present epoch back to the big bang. The time that has elapsed on a hypothetical clock which has existed since the big band and is now here on earth will depend on the motion of the clock. According to the preceding definition, the age of the universe is just the largest possible value of time having elapsed on such a clock. It was estimated to be about 13.7 billion years, with an uncertainty of 200 million years, but some recent studies have brought the conclusion that the universe must be at least 14.7 billion years old. Amazing Fact: The Universe may have neither a center nor an edge. The size of the universe is 46 billion light years. This is the distance from the planet earth to the edge of the universe. 1 light year is equal to 9.46 trillion km. The visible universe has the diameter of 93 billion light years. Amazing Fact: The milky way galaxy is whirling rapidly, spinning our sun and its other stars at around 100 million km per hour! Amazing Fact: The nearest galaxy to earth is Sagittarius Dwarf. it was discovered in 1954 with a distance of 82 light years away followed by Large Magellanic Cloud. 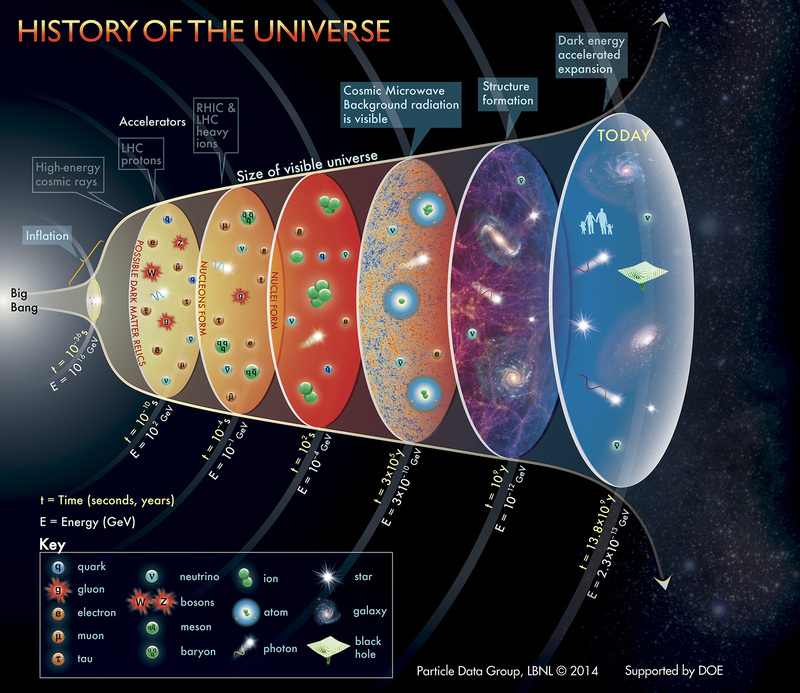 The ultimate fate of the universe is a subject of study if the field of cosmology. Either the universe will exist forever or it will cease to exist at some time. It is unknown which of these possibilities will hold true. It is also not known whether the universe will continue to support life. On the opposite side of the coin, the Big Freeze foretells of a universe that will continue to stretch forever, distributing heat evenly in the process until none is left to be usable enough. Hence, it is also known as Heat Death. A more dramatic version of the Big Freeze is the Big Rip. In this scenario, the universe’s rate ops expansion will increase substantially so that everything in it, down to the smallest atom will be ripped apart. Amazing Fact: There are approximately 10,000 pieces of material revolving around the earth. About 3,000 of these pieces are satellites, the rest are odd bits of debris.